I gotta taking Wednesday off--to get over the hump. I had a riot with these images from the challenge Sponsor: Unity Stamp Co. They must have a zillion sweet stamp images. As soon as I saw this cute car image & the sentiment "Home is where your story begins," I knew I wanted to make a project to do with travel. ...What on earth is this thinger? With the cost of the case being under $20.00, it might make a nice affordable gift for your favourite crafty person. It's a snifty opportunity to work in the 12x12 scrapbook scale/format, if you're like me & you usually make cards. 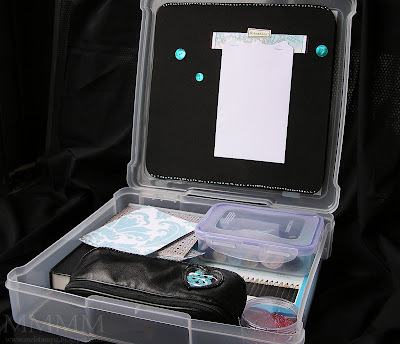 Choosing the Container: If you want to use your travel lap-desk as a piercing mat, it may be a good idea to check (while shopping for your 12x12 container) that it opens all the way (like a book) so that you can lay it in your lap or on a table without emptying the contents. It has 4/5 layers of fun foam which means that you can use thumbtacks in it (they even stay!) :O) The fun foam sticks nicely to itself & the container with really good double-sided tape. BUT...my favourite part about this fun foam mat is that it doubles as a piercing mat or for shaping flowers. And it's big so you can pierce a lot! LOL. Those turquoise mother of pearl buttons are glued onto thumbtacks with Crystal Lacquer. It helps the buttons to stick if you scratch the thumbtacks and the backs of your buttons. Directions here. the note pad is made with a scrap of homemade map paper to match the front of the box & some plain copy paper cut in a curvy shape & slapped on with staples. You'd be astounded at what you can fit in there! ...it fits inside this bag! You can find the bags here. The buttons & Crochet flowers are from my beautiful Bam Bam (aka Grandma.) She crocheted the flowers herself (she sent me about 150 of them!!! Lucky lucky lucky me, hey?) I dyed them with craft reinker (tempting turquoise) Besides colouring the crochet thread, it stiffens the flowers a little, so they'll stand up to travel. The map cardstock is just a map of BC printed out, cut out in a curvy shape & sewn. The quilted black squares are embossed with different Cuttlebug folders & stitched onto white 12x12 cardstock, then rubbed with chalk pastels. The hinges are grungeboard pieces painted with Broken China crackle paint & impressed with a wooden batik block to distress them. P.P.P.S. Want some great one stop shopping? Oh Mel how do you do it? This is just amazing - I love every little thing about it - the quotes are fantastic - the actual kit itself is so fun and oh I could go on for ever - can you tell I'm impressed. This would be so much fun to use on the train. I can just see me getting one of these out next to the guys in suits with their laptops. Wouldn't they be jealous? Lol. Thank you for your totally inspirational work - I can't believe how many totally awesome projects you come up. What a great idea, Mel! You are sooo clever!! Leaving for Vegas Friday...gonna try to throw something together similar! Thanks for the inspiration!! Oh I love it. Seriously LOVE this idea! Thanks so much. Awesome creation and idea Mel!!! CLEVER!!!!! What a really adorable travel kit!! What a fabulous idea!! THANKS FOR SHARING MEL!! sheesh woman!! you NEVER cease!!! Wow Mel! Your project is super fabulous! I love the post too, you are just amazing at giving great tutorials! awesome as always girl, do you ever do anything simple :), your work is always so well detailed and always so lovely. Wow wow wowser, you are so creative. I want one of these, love the bag too. Only question is you have the watercolour pencils, and the brush but where is the water? What a great idea. I think I have just decided what to give a few of my friends for Christmas this year. thanks so much for being so creative. I can't tell you how clever I think this is...you just amaze me some days. I love getting your feeds to keep up on all your great projects. I just became a follower of your blog after you absolutely stunning post on caardvarks. I'm new to the world of card making, and your tutorials and step-by-step instructions are just the hand-holding I need to get some great techniques down so that I can improve my own work. I have gone through and have marked a million of your projects as things to try on my own! I just wanted to say thank you for your beautiful inspiration. I look forward to your future projects! I am always curious to see what new ideas are posted on your blog... and any time I come to read it, there is a new cool kind of inspiration! One thousand tons of thank you! what a GREAT idea! love it & all your neat tips! Oh Mel, you are sooooo creative - I love it! What a fab idea - mm, going on a Scout Spring camp this weekend and apparently parents don't do too much, I think I may pack myself up one of these, lol!! Sinus advice - do you use the Neti Pot? I highly recommend it (Shoppers Drug Mart sell them) - they really help clear the nasal passages out! Hope this helps and that you get some relief! What a fantastic blog with amazing projects - it's just brilliant! Go to Wal-Mart and get EQUATE for the sinuses. THey have straight Sinus or Sinus/Allergy. Very reasonable price, NO side effects and your head clears before you know it. This time of the year I have to do the Sinus/Allergy, especially with the lilacs coming soon or I wouldn't be able to breathe at all. Wow! What a great idea! So clever!!! Love how you decorated the purse too! Ok, just the coolest! Great job. I might have to do one of these myself. Totally cool! Adorable kit!! Great job!!! 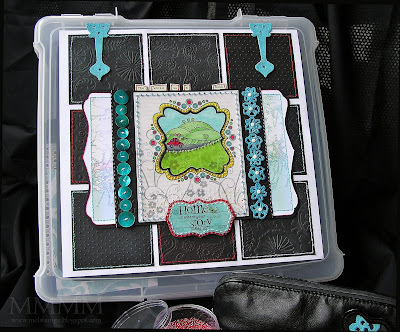 What an awesome crafter's Travel Lap desk. It's great for road trips or small trips. I love it!! You always come up with so many nifty ways to save money. You're a genius. The bag is very pretty too. How nice of you to receive such a pretty bag! !